Franciscan devotional art — Where is YOUR focus in life? Whilst in Rome I took the opportunity to visit Santa Maria della Concezione. This church is famous for its artfully-arranged crypt full of bones — but I’ll get to that later. What was really worth the money and which I greatly appreciated was the Capuchin Museum connected to the church, since Santa Maria della Concezione is, in fact, the Mother House of the entire order of the Cappuccini. In the Capuchin museum, you learn about the origins of the order and its habit and its mission as well as some famous Capuchin saints. They are called Cappuccini because of their distinctive, pointed hoods, which they believe was precisely how St Francis of Assisi wanted the friars to wear their hoods, capucci. This sort of extreme Franciscanism is precisely where the origins of the Capuchins lie in the 16th century; they wanted to get back to the centre of Francis’ Rule and the dual, beating heart of Franciscan life — the living dichotomy of the hermit who ministers to the poor and sick. Thus, in 1520, this order within the wider Franciscan family was founded. 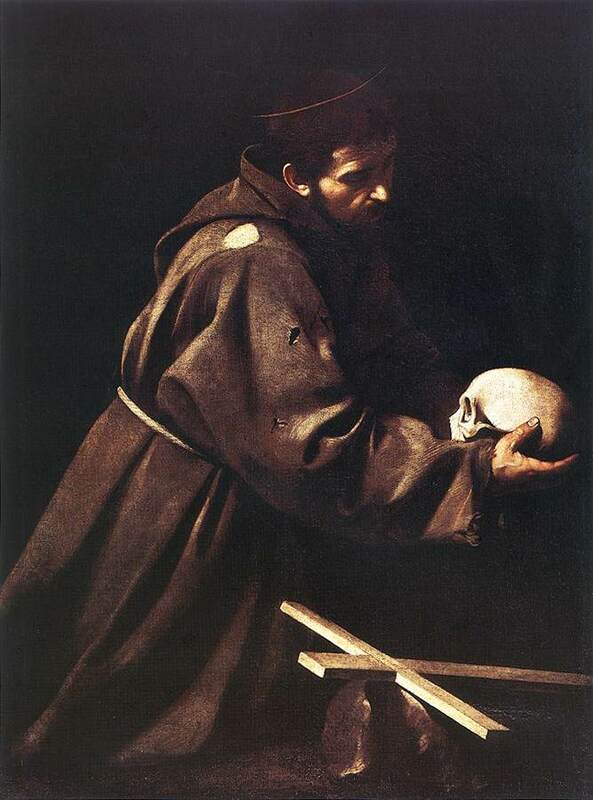 Amongst the various artefacts within the museum as well as in the church itself were paintings of different Capuchin saints as well St Francis himself — one of them possibly by Caravaggio, certainly influenced by Caravaggio if not his own. What struck me that day as I sat praying in the church (this church — especially the sanctuary — is not on the main tourist trail so it’s actually a quiet place to retreat for a moment or two) was the focus of the saints in the artwork. The saint is placing a skull at the foot of the Cross. This is not a memento mori (on which later) but, rather, a meditation upon the cross of our Lord where our salvation was wrought, where Christ trampled down death by death. I am given to understand that it also somehow signifies the stigmata, although I do not recall how. 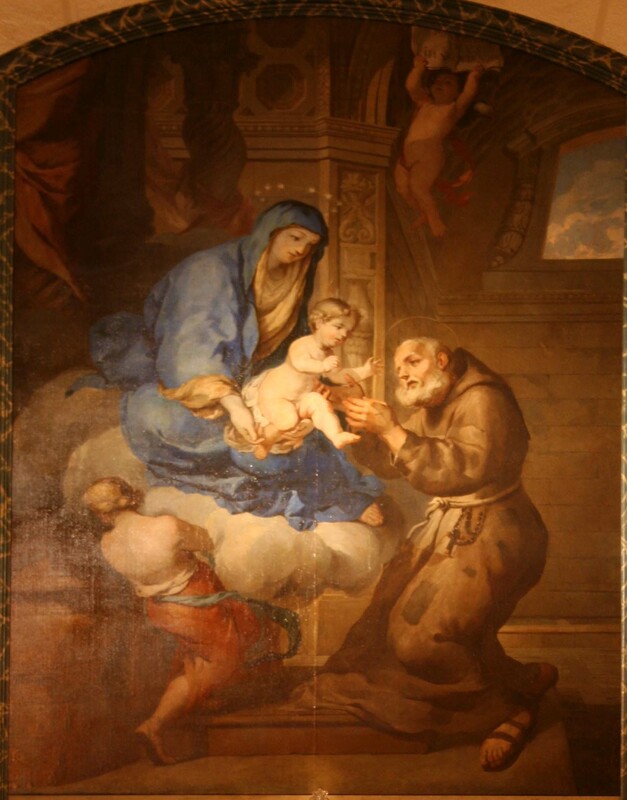 I couldn’t find any that I saw at the church, but below is a painting depicting the story of how once, St Felix of Cantalice was at prayer and the BVM handed him Baby Jesus to play with. A bit odd. Possibly silly even — appropriate for successors to the jongleur de Dieu, then. And the focus is still Jesus, who played with St Felix’s beard. St Felix also spent a lot of time in the traditional Franciscan vocation of preaching, railing against corrupt politicians and calling young men to repentance and to turn away from dissolute lives. But that sort of thing doesn’t make for cute devotional art. 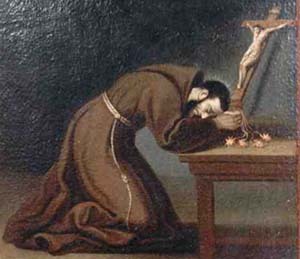 Very often, as in this painting of St Bernard of Corleone below, Capuchins are depicted praying before a crucifix, meditating upon the salvation wrought for us by Christ the God-Man when he died upon the Tree. I’m not goint to get into the details of what the Roman Church actually teaches on the rosary, but I will make a few observations. First, it has a crucifix on it. Crucifix = Jesus = Christocentric piety, as we’ve been discussing. Second, as one recites the Hail Mary’s, one is meant to meditate on the Mysteries of Christ’s life. Mysteries = Jesus = Christocentric piety. Third, every ten Hail Marys get a Lord’s Prayer. Lord’s Prayer comes from Jesus, is directed from the Father is Christocentric if not Trinitarian piety. Fourth, and this is why I’ve never used my rosary ‘properly’, since Mary is only esteemed because of her Son, the Hail Mary is itself an act of devotion to Christ. My brain can’t make that transition, but there you have it. In sum: rosaries = Christocentric piety. 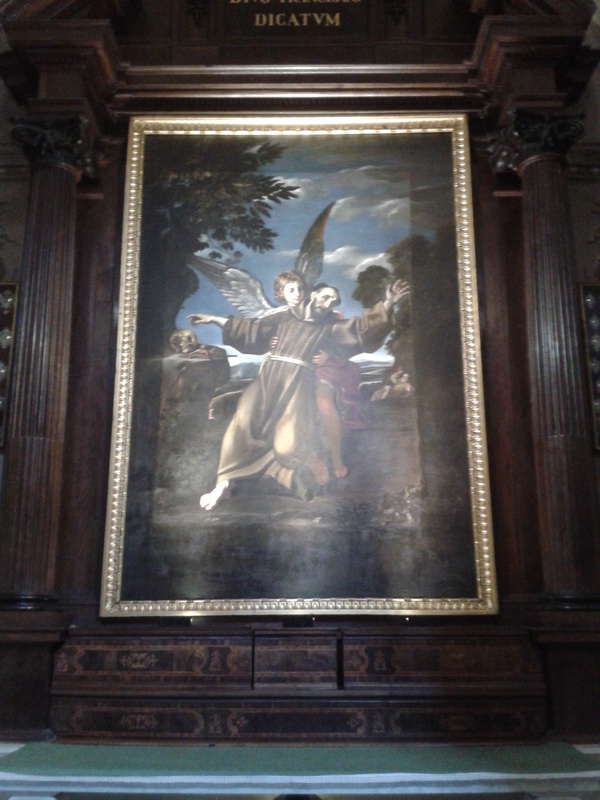 Here we have St Francis being held up by an angel whilst in ecstasy. The emphasis is on meditation, perhaps on mortality, perhaps Christ’s death (hence the skull) — the saint has been transported beyond this world in the spirit, so his body is kept safe by one of the Almighty’s angels. The focus of all Christian meditation is ultimately the Holy Trinity, usually by focussing upon the words, acts, and salvation of Jesus. What do you focus on? I admit that I am challenged by these paintings. I focus on Anglican controversy. I focus on being clever and solving riddles. I focus on me and what makes me happy or comfortable. The Franciscans challenge us to a better way. Focus instead on the Crucified.